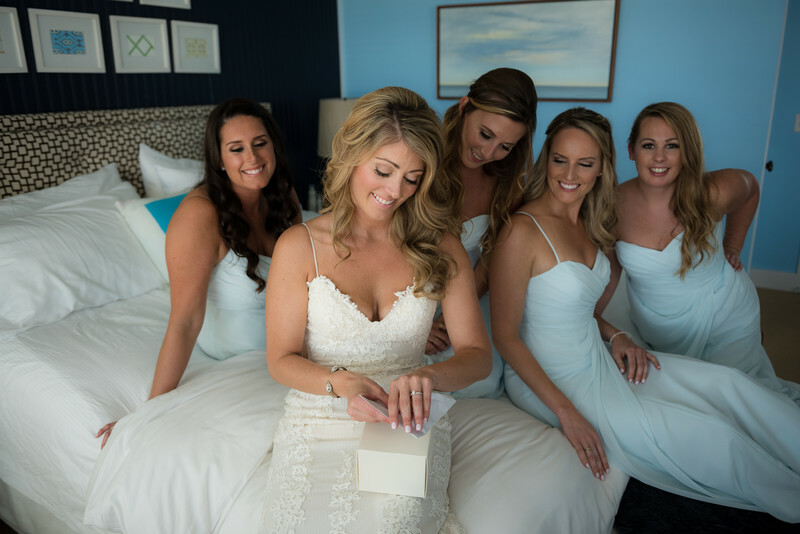 Jenna and Mike had a classic beach themed wedding hosted at the Tides Beach Club in Kennebunkport, Maine. Here in the nautical themed getting ready room, Jenna opens her gift from her soon to be husband has her bridesmaids watch with anticipation. Often special events like this one can be rushed through and it's so important as a wedding photographer to slow it down and create the moment that it should be. We waited for the makeup artist to pack up her things for the one place in the room with perfect lighting. The bed was cleaned up and Jenna and her bridesmaids were given suggestions as to their placements. The was just a piece of the wonderful scene that was layed out and the rest natrually unfolded. As a wedding photographer I am not there to arrange the day but instead work with it in a way that will represent it in the most beautiful way possible. Jenna could have easily opened her gift by the coffee table next to the drink cups, phones, and old food but instead I advised her to wait until the makeup artist left. Thankfully were had some time to spare and this gorgeous image was created. Location: The Tides Beach Club, Kennebunkport, Maine.